For no particular reason except my own entertainment, I've started to build yet another radio clock. I don't keep up with counting them, so I don't know how many of them I've built before. 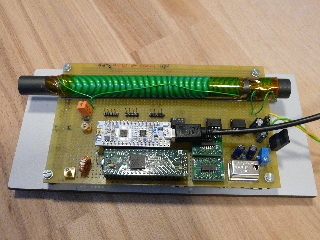 An early homemade radio clock based on a TCA whatever AM receiver chip and an 8051 MCU for decoding and display control. Coding was done in pure 8051 assembler. Used an IR transmitter to push the demodulated DCF77 pulses into the IRDA port of a laptop, running ntpd to decode it. 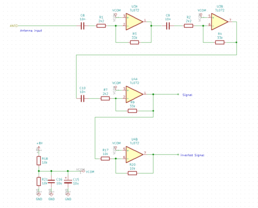 An attempt to make a noise / disturbance tolerant radio clock using an Infineon XE167 MCU. 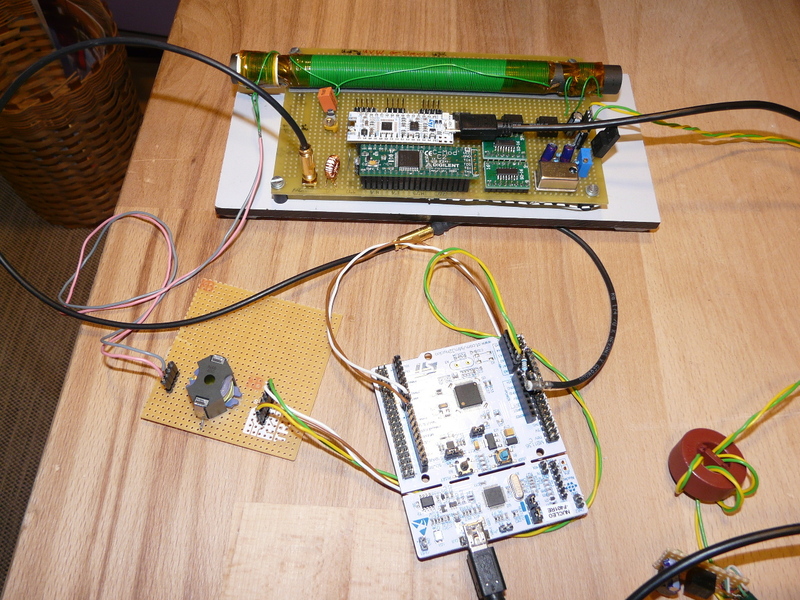 Implemented a dual channel DCF / PPS receiver to an STM32F7 nucleo board. This one provides time and date to my home CAN network. Note, these are all DC77 (German / European time standard) radio clocks. Most of the above is lost or not available for public disclosure. Another common "feature" of these radio clocks is: All of them use the DCF77 AM (amplitude modulation) time code only. This is pretty common for most commercially available radio clocks. The DCF77 doesn't transmit the time code amplitude modulated (AM) alone, but also on PM (phase modulation). See the DCF77 Wikipedia article for a detailed description. The PM receiving method provides one with superiour time accuracy in comparison with the usual AM receivers, though it's not as accurate as an GPS timing receiver. So the goal for is set: Build a Phase Modulation DCF77 radio clock with some robustness in time code decoding. 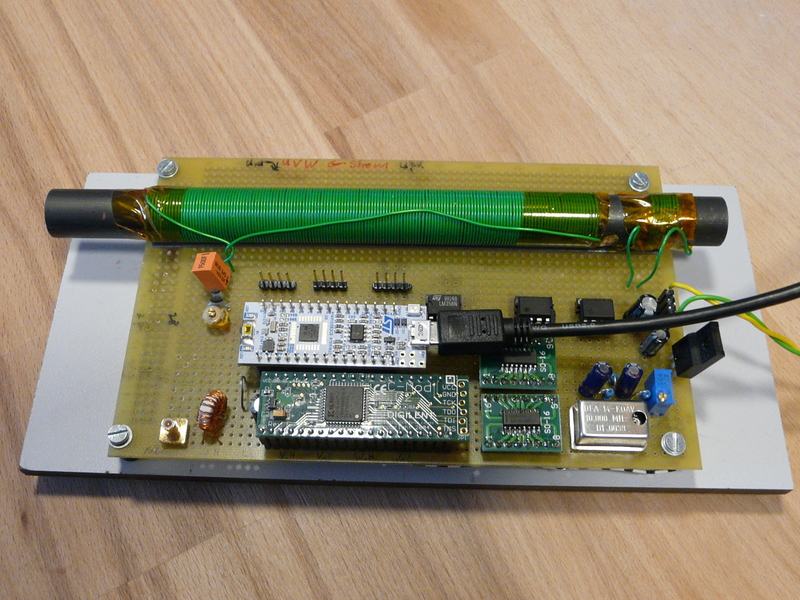 Additionally, this radio clock will provide a 10MHz reference frequency and a PPS (pulse per second) output. 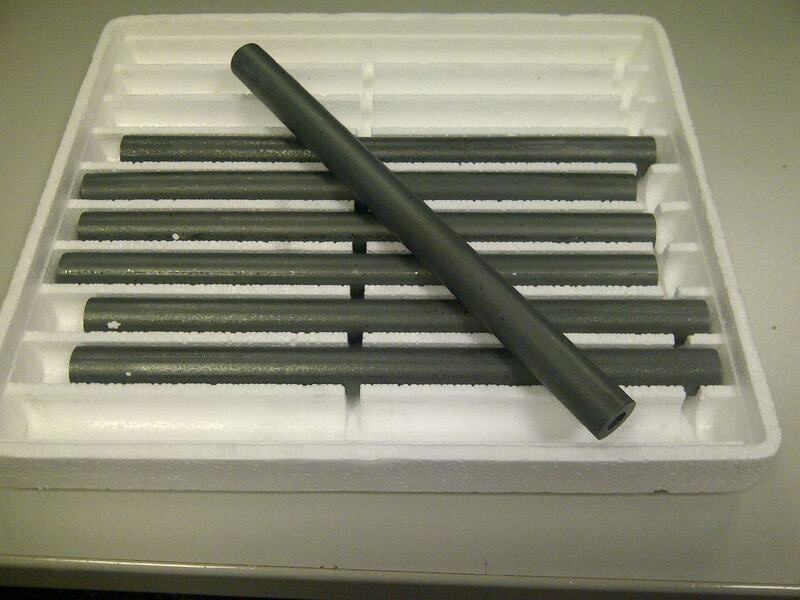 What's the purpose of that ferrite rod sitting in the junk box? As so often with this kind of stuff, it just happens to be there. Now can I do something useful with it? 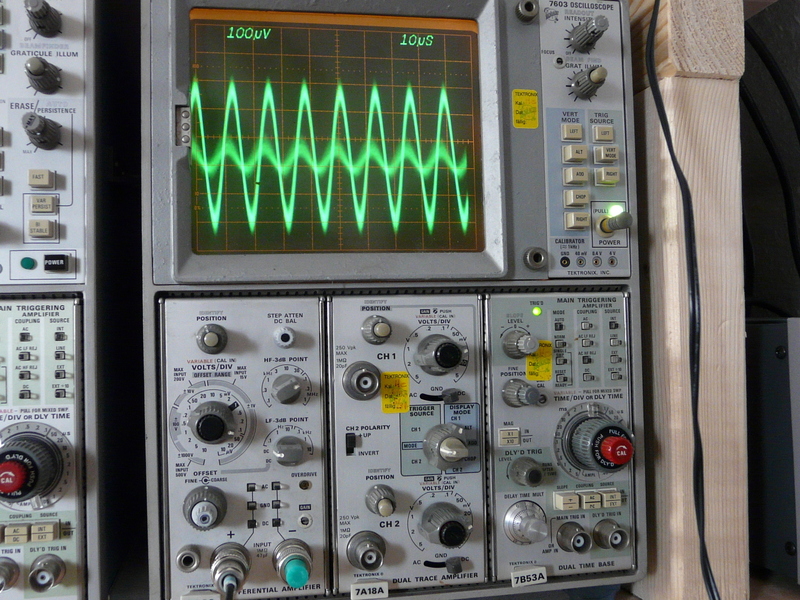 Using an oscilloscope with a highly sensitive input, one can see now the received DCF77 carrier. By rotating the antenna rod, one can evaluate the directivity of this construction. If one uses such kind of antenna to take a bearing of the transmitter, one rotates the antenna to minimum signal level. 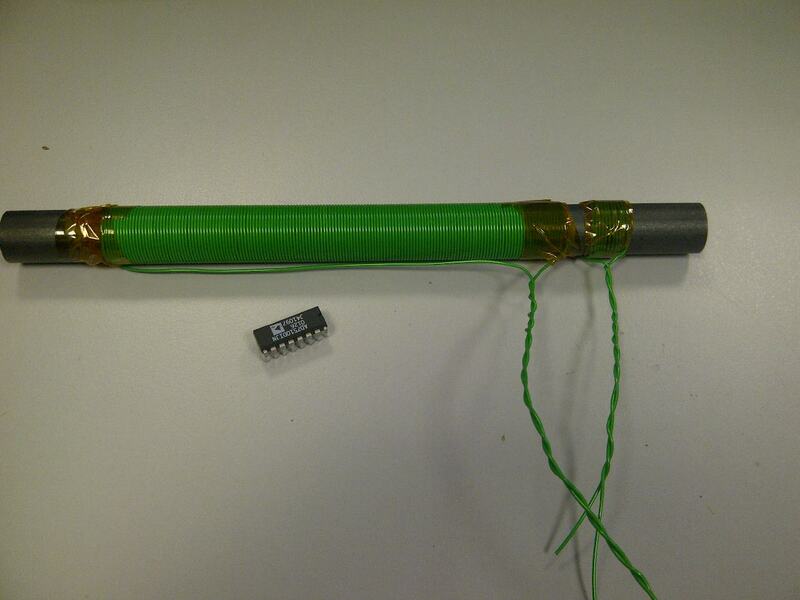 The transmitter is now aligned to the longitudinal direction of the antenna. Now feed a synchronous rectifier with that signal. In fact, use two synchronous rectifiers, one in-phase and one quadrature. As these mixers are implemented using analog switches that are reversing the polarity of the signal, I'd rather call them rectifiers than mixers. Although your typical diode ring mixer works the same way and is called a mixer. 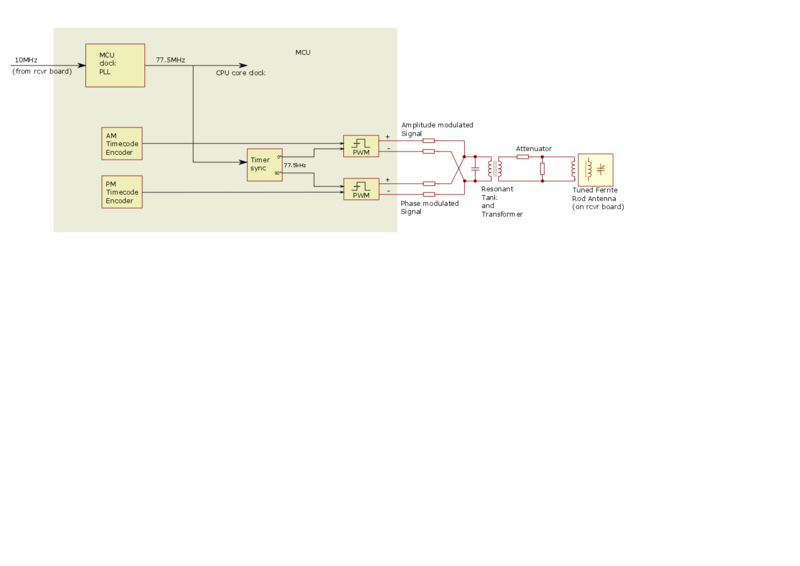 The mixer requires two LO signals: Both of them at the 77.5kHz carrier frequency, but having a 90� phase shift. I'm using a CPLD to create these signals from the 10MHz master clock. That's all she wrote. At least for the analog signal processing part. 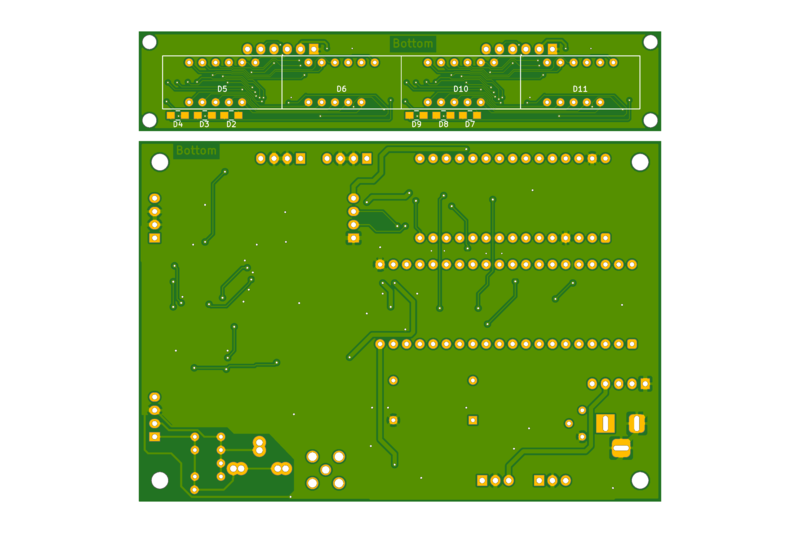 See the complete analog schematic page here. The receiver requires an accurate 77.5kHz I/Q clock frequency to demodulate the signal. A commonly used reference frequency for all kind of purposes is 10MHz. So I decided to create all the required frequencies from a single 10MHz source. Your favourite calculator tells there's no even divider ratio (not even an odd one) from 10MHz to 77.5kHz. To create even more difficulties, usually one uses four times the carrier frequency (say 310kHz) as an input to a divide-by-four circuit to create the in-phase and quadrature clocks. 10M divided by 310k results in 32.25806452. By chance, this equals 1000/31 or 32 8/31. Dividing 10MHz by 32 results in 312.5kHz. 310kHz / 312.5kHz gives an (124/125)/32 ratio (which suprisingly equals 1000/31) required to get 310kHz from 10MHz. 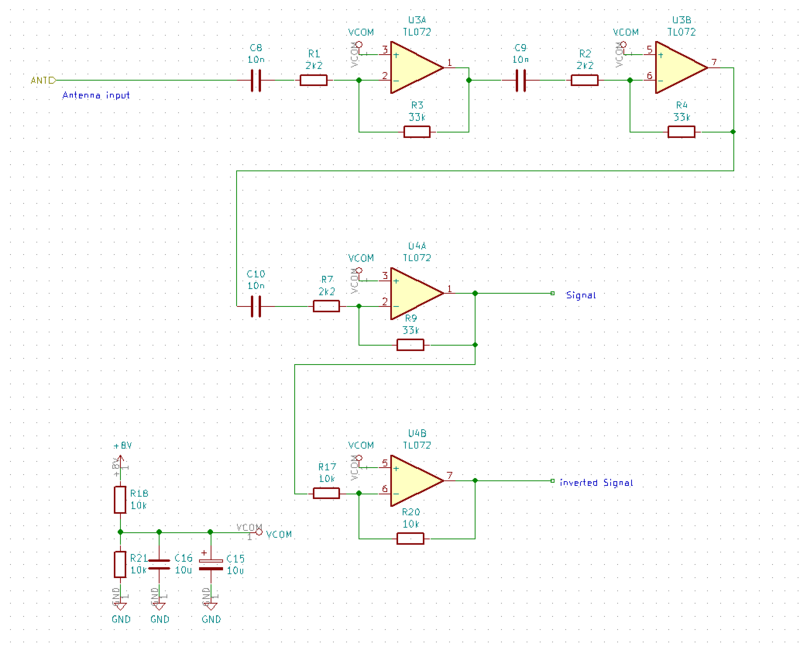 So one can use an divide-by-32 circuit and skip some pulses (one out of 125) to make up that division ratio. It's all implemented in a few lines of VHDL code and runs within a small CPLD. 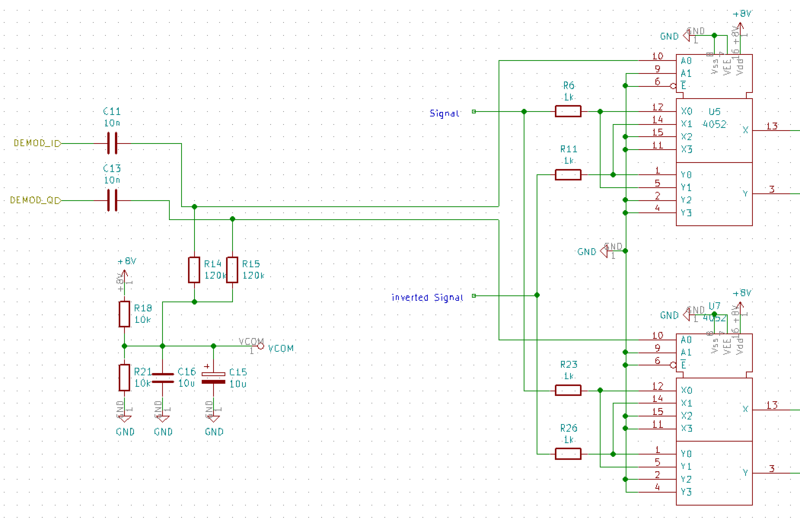 See the clock generator schematic page here. 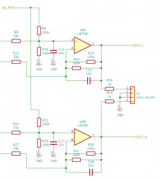 No, not a fancy Digital Signal Processor here, but a Cortex-M4 based MCU. For lazyness, I've used a STM Nucleo-32 Module. 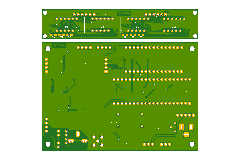 Due to the memory (especially large RAM buffers) requirements of the demodulator and decoder, this turned out to an STM32L432 based module. See the MCU schematic page here. 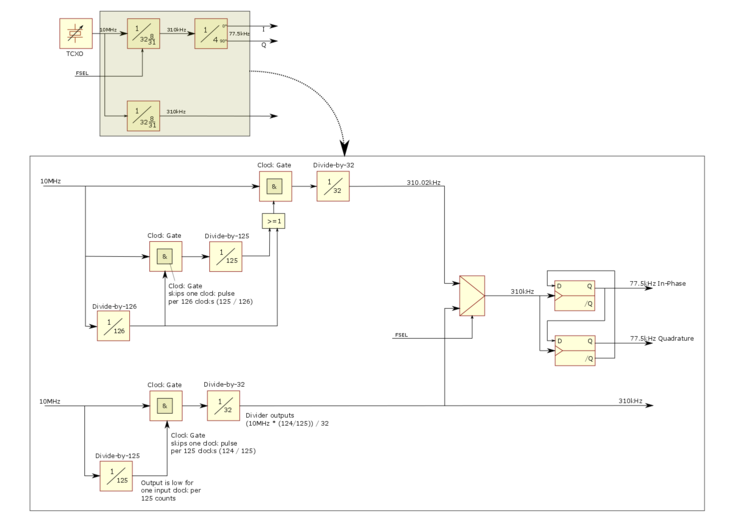 And the whole shebang: DCF77 radio clock prototype schematic. Click the image for a higher resolution version (works for the other images too). While drawing the latter diagram, I noticed the divider chain for generating a slighly offset carrier frequency beeing unnecessarily complex. 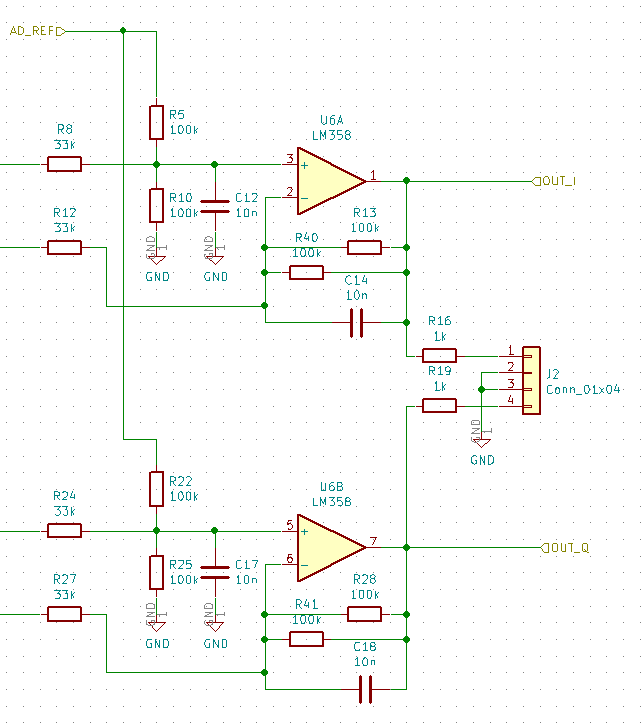 A simple 125/126 clock pulse skip would have done the job, not that cascaded 125/126 and 124/125 logic that I struggle to understand now by myself. That's one of the downsides of the modern stuff, one can easily pin down some VHDL code that works and fulfils the job, but is too complex from a hardware view. Anyway, it works, and its purpose is as said to generate a slightly offset 77.5kHz LO frequency. This is required for the ADC auto offset calibration routine. 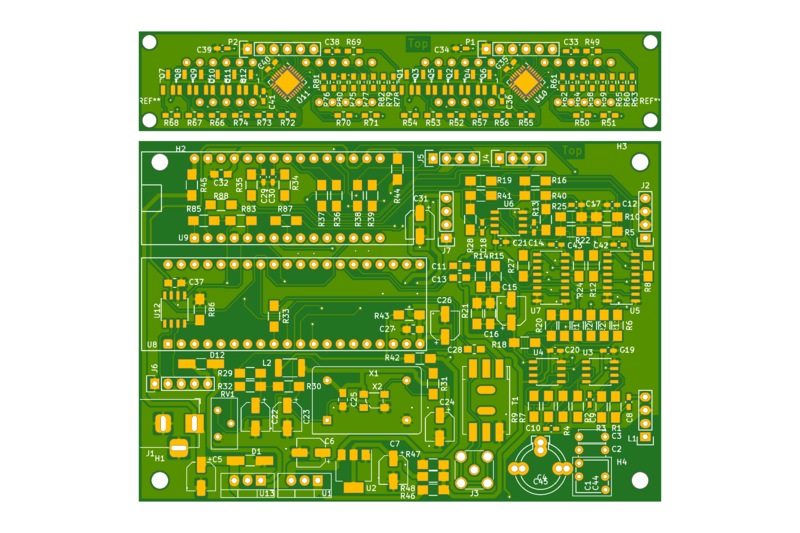 The demodulator outputs a small DC offset that must be subtracted from the signal to make the phase detection work at low signal levels. As the demodulator is intended to mix down the signal to DC, there's no easy way to discriminate the signal from the offset. Slightly changing the LO frequency does the trick then. By doing so, the demodulators output a low frequency AC signal that gets averaged over some periods. 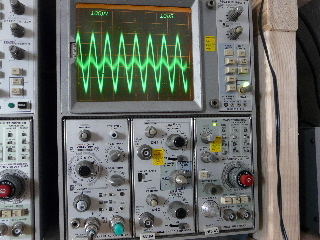 By averaging, the offset (still the DC part of the signal) is measured seperately from the signal (now the LF AC signal) and is used to compensate for the offset error while the LO is running at its nominal frequency. 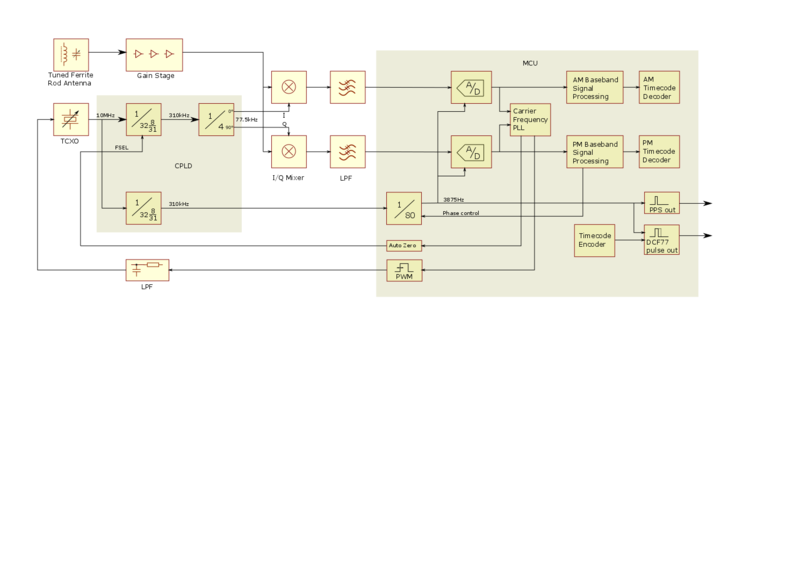 Some means to not mess up the LO phase isn't shown in the block diagram. The automatic offset compensation is run about every three minutes. Debugging and testing the DCF77 time code decoder firmware required a means to generate arbitrary time codes. Especially the code transitions at DST / regular time switchover and leap second insertion were kind of interesting. Say - it took a significant amount of effort to get these work seamlessly. The time code encoder uses the very same C code as the reference time code encoder of the receiver, so once the simulator is verified to produce the correct codes, the receiver is believed to use the correct time code to correlate against the received bits. 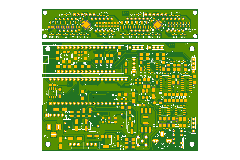 KiCAD project is provided here for your convenience. 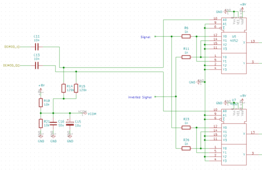 Created from that, the schematic as a PDF. These inspired me to create this receiver. Although my design isn't a copy of any of these, you'll find part of their concepts and ideas in my design. So a big "Thanks" to the authors of this stuff.